I often struggle to please everyone at my dinner table. Let me rephrase that. Not everyone at my dinner table is always pleased. But I don’t usually agonize about it. In the early years of foodie plus two or three, I felt like a short-order cook. Being overly concerned that my wee ones were getting proper nutrition, I hovered and worried when they didn’t eat enough “good” food. Now, through necessity and pure exhaustion, what you see is what you get. If it’s not on the table, you’re not eating it, except perhaps for an apple or banana when someone’s extra hungry. Although I can’t say this philosophy always makes for a happy table, more often than not, we eat in relative peace without going back and forth from kitchen to table like waiters. G and I have concluded (after 11 years of trial and many errors) that serving dinner family style and limiting the choices helps everyone relax and focus a little more on each other through conversation and a little less on the food (except for the oohs and ahhs of a really delicious dinner – those are always welcome). But back to the food. I’ve discovered that the food I prepare for my children also can be appealing to adults. It just takes some planning and creativity. Here is a perfect illustration of how this works. Most children love chicken fingers. I have to say that I cringe when they eat nuggets or strips at fast food joints. There’s nothing more unappetizing to me than biting into a piece of “chicken” and realizing that it is really a thousand shreds of stuff pressed into the shape of chicken. Gross. Thus, we often skip the drive thru’s (except Starbucks—my vitamin on certain days). I started making our own crispy chicken tenderloins, but something was missing. While my little foodies were happily dunking the strips in ketchup, my husband and I were not so thrilled. 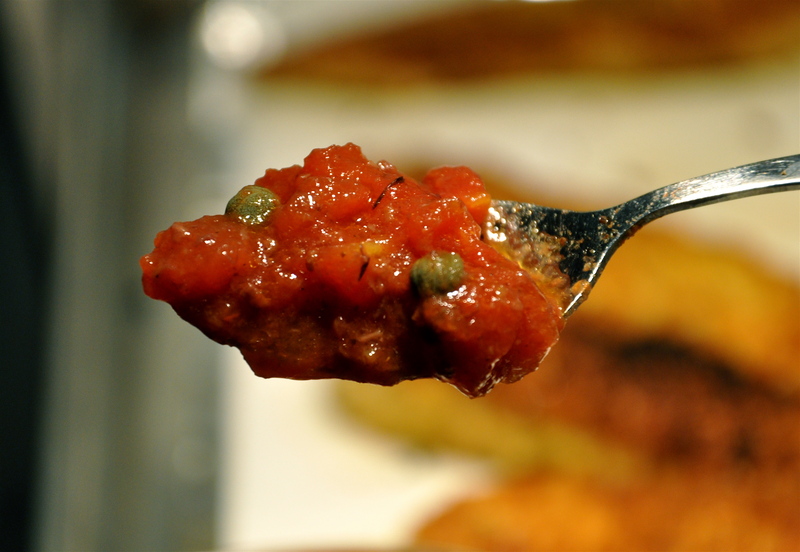 So when I stumbled upon a recipe for Tomato Relish (doesn’t “chutney” sound better? ), I tried and tweaked it until—yum. Now we can all sit down to a meal that we enjoy without the adults feeling like we’re eating a Happy Meal. And in case anyone was wondering what to stuff into my stocking, remember these green bags? I’m finally out of them. 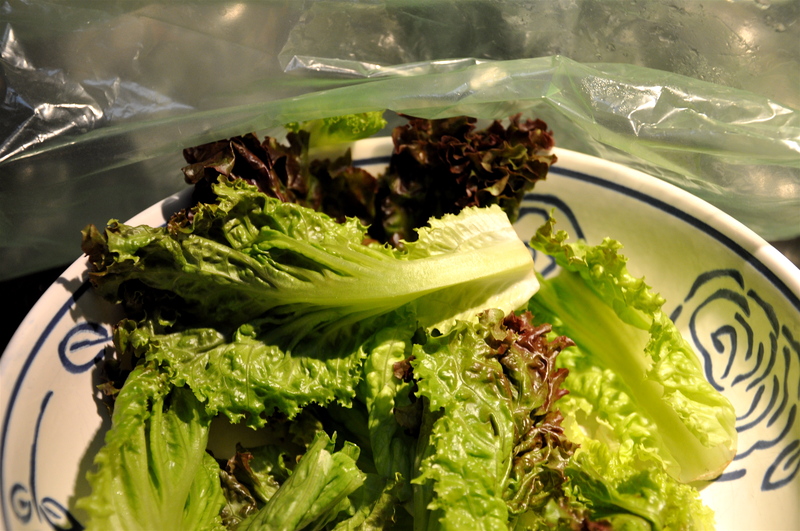 This lettuce was in my refrigerator for 9 days—9 DAYS!—and look how fantastic it looks. 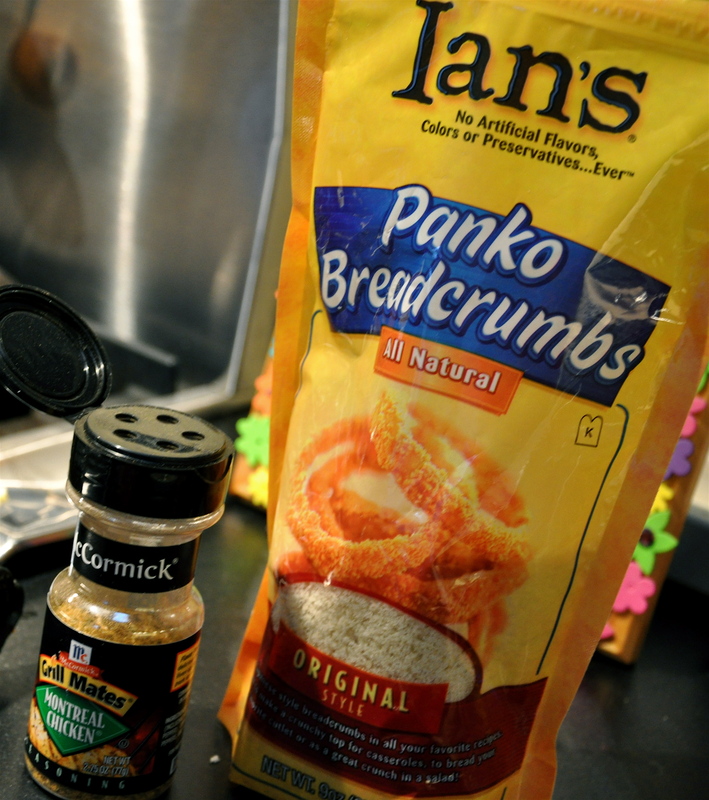 Perfect for a salad with our panko-crusted chicken. For more helpful tips, check out Works-For-Me Wednesday at We Are THAT Family. Preheat oven to 350°F. Line baking sheet with paper towels. Line another baking sheet with foil. 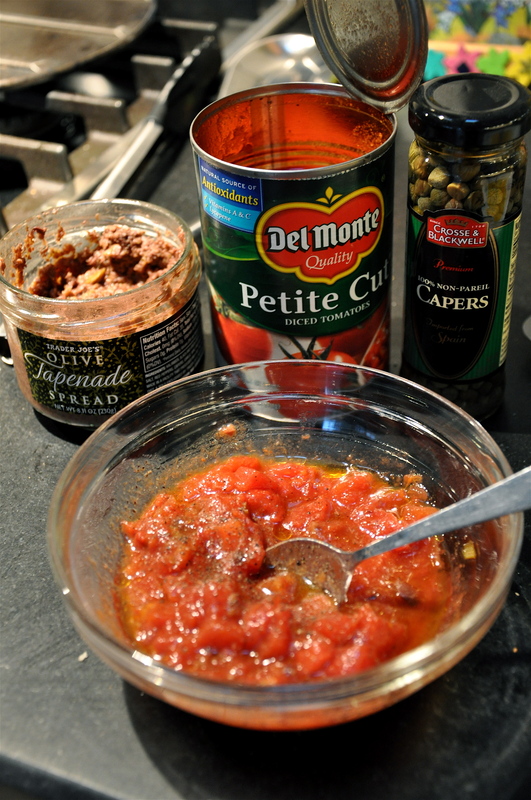 Mix together ingredients for the chutney. Set aside. In three rimmed plates or pie tins, put the flour, the beaten eggs, and the breadcrumbs mixed with the Montreal Chicken seasoning. 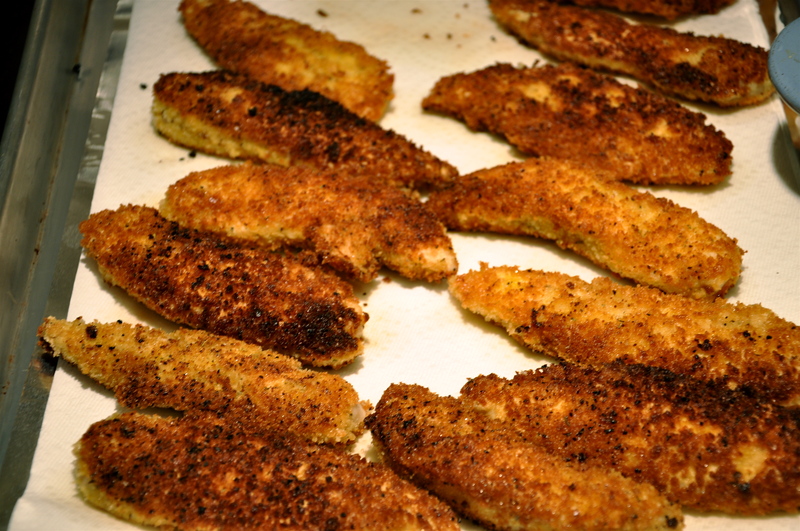 Dredge each tenderloin in flour, pat off the excess flour, then dip into the egg, followed by a roll in the breadcrumbs. Put on a plate and repeat with the remaining tenderloins. Heat 1/2 cup vegetable oil in a large skillet over medium heat. Keep chicken hot by transferring to the foil-lined pan and putting in the oven. 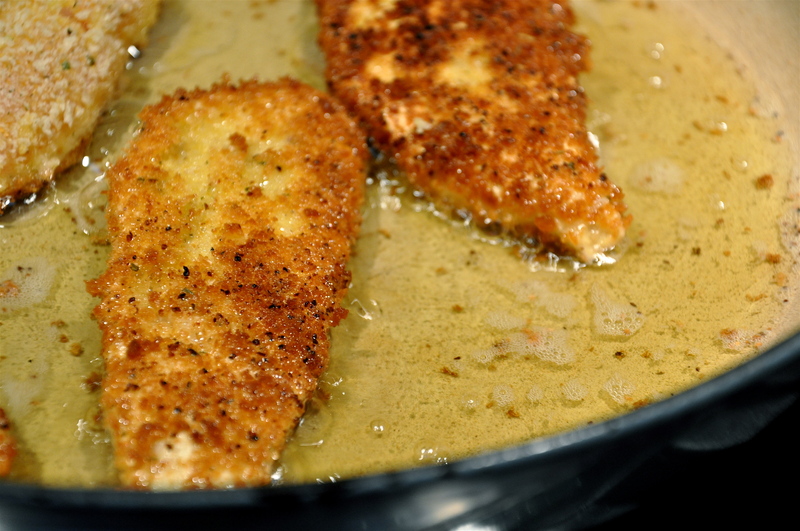 Serve chicken warm with the chutney. This soup performed a miracle for our family. This was the first time my middle daughter (a.k.a., the Baker) ate soup, including the chunks of tomatoes and carrots. Hallelujah! I could have paid my neighbor for inviting the kids over impromptu one evening and showing them how to make (and EAT) hamburger soup, vegetables and all. There are no rules for this soup, so it comes out a bit differently each time. I began with the original recipe from my neighbor, but when I got the basic idea down, I just added what veggies I had in the fridge. When I recently made this soup, it was absolutely the best version—probably because of the secret ingredient: leftover gravy. If you’re like I am, you have a moral dilemma when it comes to disposing of extra gravy. How can I throw the essence of a great meal down the drain? I can’t. So I usually end up putting it in soup. Here are some parameters for our hamburger soup, but please experiment with what works for your family’s tastes. In a stock pot, brown the meat. Drain excess grease. Add the carrots, onions, celery, and garlic. Cook on medium heat until beginning to soften, about 8–10 minutes. Add the juice from the can of tomatoes; chop and add tomatoes. Add broth, beans, bay leaves, and gravy. Simmer for 20–25 minutes. Add salt and pepper to taste. Serve with crusty bread and a salad (if your little foodies will eat it!). Serves 6 with a bit leftover. For more tips, go to Works-For-Me Wednesday at We Are THAT Family. All I can say is…she’s back. And with a vengeance—at least in her baking determination. These were not your average Eggos. I’ve only had yeast or raised waffles once before, and they are incredibly tender and delicious. These should be made on a standard waffle iron because they do not puff up like Belgian waffles. However, if that’s the only kind of waffle iron you have, don’t let it stop you. And if you are wondering if I fed my children rum for breakfast? Absolutely. The alcohol burns off, and the resulting flavor is delectable. K did a masterful job with the batter the night before, which made it so much easier in the morning. I just helped with the cooking part in the morning. You know, so she could eat while I toiled away. I guess that’s fair. Mixing the batter the night before (and using the mixer as a headrest). Bacon dipped into syrup = salty–sweet perfection. When my friend gave me this The Sweet Melissa Baking Book, K immediately thumbed through and marked every recipe that she wanted to make. Look! We only have a few more to go! For more tips, click over to Works-For-Me-Wednesday at We Are THAT Family. In a large bowl, combine the warm water and yeast. Let stand for 5 minutes to dissolve and activate. In a small saucepan over low heat, melt the butter. Stir in the milk; the butter mixture should be warm but not hot. Add the butter mixture, salt, sugar, flour, and nutmeg to the yeast mixture. Using a wire whisk, beat until smooth. Cover the bowl with plastic wrap, and let stand at room temperature for at least 8 hours or overnight. In a medium bowl, whisk together the eggs and the baking soda and immediately whisk them into the batter. The batter will be very thin but smooth. Spray the waffle iron with nonstick vegetable cooking spray. Cook the waffles according to the manufacturer’s instructions. Melt the butter in a large skillet. Add the brown sugar and salt, and stir over medium heat until melted and bubbling. Remove from the heat and add the rum, then carefully return the pan to the heat. Be careful when you add the rum and return the pan to the heat. The rum is going to flame up, but don’t worry; it’ll go out momentarily. When the flame is out, continue simmering to burn off the alcohol for about 30 seconds. Add the sliced bananas and stir to coat. Add the maple syrup and bring just to bubbling. Remove from the heat to cool slightly. Serve the bananas over the waffles. Makes 6 waffles (this recipe made 6 double waffles in my Belgian waffle iron, so that’s 12 individual waffles). I know. This recipe needs a new name. Meatloaf is a relatively new meal in our home. Because my experience with meatloaf was back in the 70s and involved a dry, gray slab of tasteless hamburger, I had never made (and rarely ate) it until about three years ago. My friend brought a meal over one night, and it was meatloaf. The kids were excited and I was willing to give it a second chance, mainly because she told me it contained bacon and red wine. I had a second helping that night. It was delicious, and in my many attempts to recreate her succulent, juicy and flavorful dish, the recipe below is what I’ve settled on. But not exactly in its original loaf form. Enter the muffin tin. As I was combining the mixture a couple of nights ago, I realized it was late and we were hungry. Anyone who knows meatloaf understands it takes about an hour to cook. My mind weighed the options: microwave the meat, have this tomorrow night and feed them cereal tonight, or find a smaller pan. Then, bing! The muffin tin came to mind. This cut the cooking time in half and made perfect serving sizes for the children (who knew meatloaf could be “so cute”?). While they were cooking, I whipped some Yukon gold potatoes with chicken broth and McCormick Montreal Steak Seasoning. Comfort food comes in all sizes. For more Works-For-Me-Wednesday tips, visit We Are THAT Family. Pour milk into shallow dish. Soak bread in milk. Mix the beef, pork, bacon, onions, and garlic in a large bowl with a fork. Squeeze excess milk from bread, then tear off in pieces and add to the meat. Add wine, ketchup, eggs, cheese, salt, and pepper. Combine thoroughly with your hands (kids love doing this). Divide into non-stick muffin tins. Top with a generous spoonful of tomato sauce. Cook for approximately 25–30 minutes or until center is no longer pink. Makes 16-18 mini meatloaves (is that a word?). My son has a lunchbox; not a lunch sack or cooler or pack. An actual metal lunchbox. And I love it. Because his lame mommy never bought him a lunch sack back in the fall, W brown-bagged it for most of the year. But in the spring, he saw this and had to have it. I (and my guilt) felt it was worth the $12 and was duly rewarded twice a week as his beaming face brought his “real” lunchbox to preschool. He felt like the MAN carrying that box of tin into his classroom. As for what goes into that lunchbox (and the three others), the contents don’t always elicit a smile. Being a foodie, it pains me to send junk food to school with my kids. Once in a while, I don’t mind them eating Doritos, Oreos, or cheese puffs, but I just cannot bring myself to pack those for lunch everyday. And because my foodies would rather bring lunch than buy (a good thing, right? ), we’ve had to get creative. I just recently stumbled across this trail mix. It was sent home (along with oodles of candy!) with my two little foodies after a visit with their grandparents in NH. Trail mix that has chocolate and no raisins = delicious to me. I assume this mix is available at grocery stores. These little packs are handy, or just repackage a large bag into the smaller snack-size baggies. Trader Joe’s has an excellent assortment of trail mixes at reasonable prices. With this or similarly sized containers, the possibilities are endless. We have used ours for ranch dip (with carrots, cukes, red peppers), peanut butter (with apple slices or a banana), honey (with sliced fruit or graham crackers), homemade pudding, and yogurt. The foodies love this snack. They often don’t finish a whole apple, so by slicing two apples, tossing with some cinnamon sugar, and packaging in zipper bags, we get four snacks. For more Works-For-Me-Wednesday tips, click over to We Are THAT Family.